The ultimate in high altitude, high-tech catering has arrived in Chile to serve chilled "provisions" to the telescopes at the largest astronomical complex in the world, the Atacama Large Millimeter/submillimeter Array (ALMA). After its month-long journey from Taiwan, the first of two Front End Service Vehicles (FESV) is being tested at the ALMA Operations Support Facility in Chile. In this photo, the FESV cabin has raised to service the interior of a North American ALMA telescope. This first FESV is named Mei hua after the Taiwanese plum blossom, a revered, winter-blooming flower. Until now, servicing the state-of-the-art superconducting receivers inside an ALMA telescope has required hauling the entire 115-ton telescope from its observing site at 16,500 feet down to a support facility at 9,500 feet. The dangerous 40-mile roundtrip, atop a monster truck called the ALMA Transporter, uses hundreds of gallons of diesel fuel, and the telescope’s absence from scientific observing can be as long as four days. The newly arrived servicing truck, called the Front End Service Vehicle (FESV), is a custom designed truck packed with the equipment required to transport and service ALMA's temperature-sensitive astronomical equipment without removing a telescope from the working array at 16,500 feet. "With the arrival of the FESV from our partners in Taiwan, we have delivered another critical element for the array, one that will reduce interruption to science, increase safety and efficiency of telescope maintenance, and reduce ALMA’s carbon footprint," said Dr. Mark McKinnon, North American ALMA Project Manager at the National Radio Astronomy Observatory (NRAO) headquarters in Charlottesville, Virginia. Dr. Mauricio Pilleux, who is heading up the telescope servicing project as the North American ALMA Deputy Project Manager based in Chile, said that ALMA’s telescopes will need technical attention every day. “It’s the most complex hardware ever built in so harsh a place. We need fast, safe, temperature-controlled servicing." The FESV is based on the familiar Volvo FH 6x4 chassis: It is 36 feet long, 8 feet wide, and weighs 26 tons. The truck’s built-in scissor lift is designed to push its cargo cabin 20 feet straight up to align with the receiver cabin of a telescope, similar to catering trucks that align with airplane doors, allowing personnel inside to replenish provisions directly at the airport gate. The truck enables personnel to service million-dollar, state-of-the art hardware at one of the harshest locations on Earth, the Chajnantor Plain in the Atacama Desert of northern Chile. Working at an elevation of 16,500 feet, the FESVs will be at altitudes higher than even small aircraft can fly. To function in this extreme location, the FESV has insulated walls and a 440 HP turbo diesel engine. Each FESV also includes an air-conditioned cabin and an on-board generator to keep ALMA’s receivers cryogenically cooled to 4 Kelvin (-452 °F) during transport and servicing. The roomy compartments carry telescope power supplies, air tanks, and a suite of maintenance equipment. The most specialized of these devices is a sturdy forklift trolley, the Front End Handling Vehicle (FEHV), which is being custom-built in Chile to safely maneuver an entire three-quarter ton ALMA receiver cabinet, called a Front End. "Even with its robust outfitting, the FESV consumes only 20 gallons of diesel during a servicing run, including the fuel used by its generator,” said Martin Oestreich, FESV Subproject Manager for NRAO. “Maintenance down time is also greatly reduced. A servicing turnaround with an FESV can now be achieved within an eight hour shift." Said McKinnon, “ALMA's servicing fleet certainly is unique -- but it has to be, for such an extraordinary project as ALMA." Upon completion, ALMA will be an 11-mile wide array of 66, ultra-precision millimeter-wave telescopes built by ALMA’s multinational partners from North America, East Asia, and Europe. These telescopes will work as one giant telescope to open a new window on celestial origins, capturing never-before seen details about the very first stars and galaxies in the Universe, probing the heart of our galaxy, and directly imaging the formation of planets. 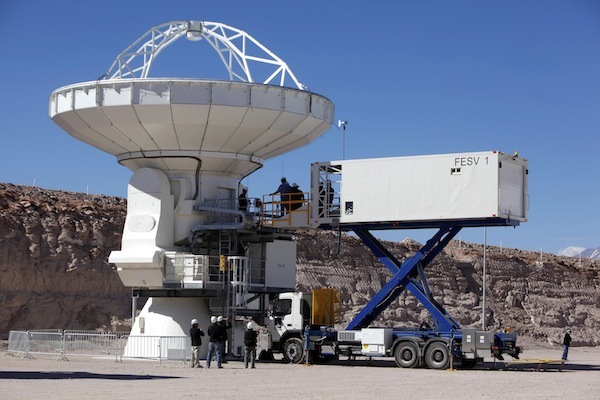 Two FESVs were commissioned by the National Radio Astronomy Observatory, with the help of one of their partners in ALMA, the Academia Sinica Institute of Astronomy and Astrophysics. They were built by CoTech in association with Ke Chong Industries in Taiwan. The FEHV was designed and is currently being fabricated (respectively) by Chilean firms Prolaser Ltda. and Walper y Cía. Ltda.